Barterhouse made the journey out to Park Slope, BK to celebrate the opening of a fun new bar and restaurant, Kindred Spirit. 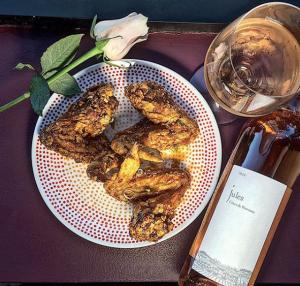 Located right next door to one of our favorite wine shops, Wine365, our featured wine was one that is available at both locations in Park Slope–the Jules Côtes de Provence Rosé. As the rosé was flowing and people were mingling, Wangs Fried Chicken served up their delicious fried chicken that mixes East Asian flavors with Southern-style cooking. To visit Kindred Spirit and Wine365, they are located at 385 4th Avenue, Brooklyn, NY. For more information about Wangs, visit http://wangsbk.com. You can also order online!